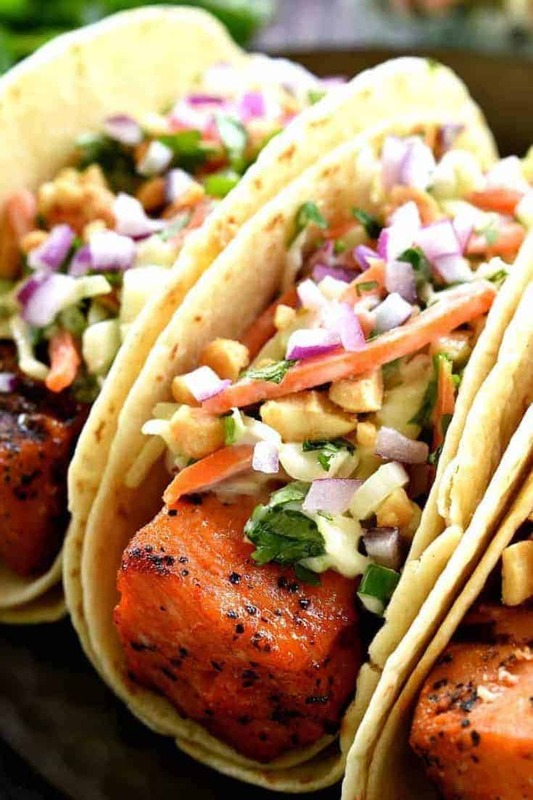 If you love salmon, you’ll adore these Sriracha Salmon Tacos! They’re topped with a simple Cilantro Lime Cole Slaw for the perfect balance of spicy and sweet. The BEST way to mix things up on taco night! You know when you’re out shopping and you see something that would be absolutely perfect for someone? And even though you’re not sure they would actually want it, or use it, it’s all you can do to stop yourself from buying it? I feel like that happens to me ALL THE TIME. Except, of course, when I actually need it to. So I usually struggle to find Jorden something for Father’s Day or Christmas or his birthday… but when I’m out randomly shopping for Halloween costumes for the girls? Well, that’s when I find him the most perfect gift of all: a giant, adult-sized Sriracha costume. Did I end up buying it? No, but have I regretted that decision every day since? You better believe it. Because if there’s one thing that Jorden loves more than almost anything else, it’s sriracha. And if there’s one thing I’d love to see more than almost anything else, it’s Jorden dressed like a big bottle of sriracha. Seriously… why did my practical side have to kick in at exactly the wrong time?? Well, the truth is I love sriracha, too. And anytime I find something new to try, I do! 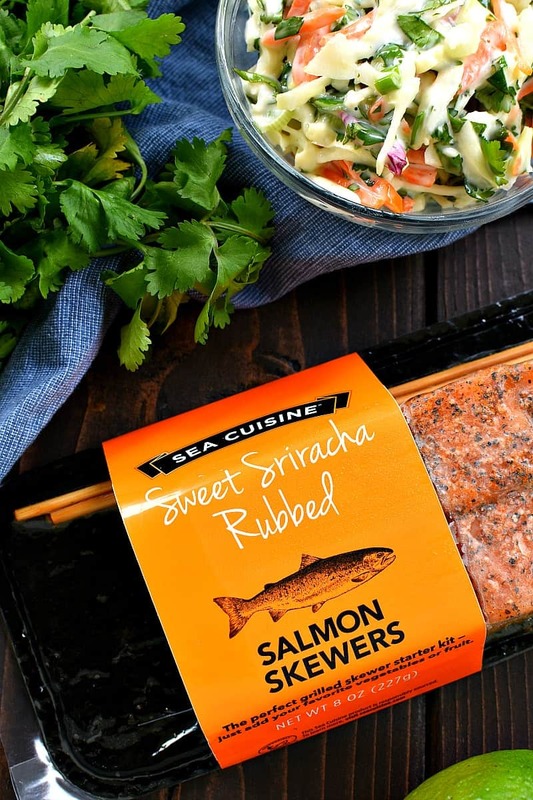 So when I discovered these Sea Cuisine Sweet Sriracha Rubbed Salmon Skewers, I couldn’t wait to check them out. They’re premium, protein-filled & flavorful cuts of seafood you can feel insanely good about feeding to your family. And OMG they are so good! Of course, with summer and grilling season here, they’re extra perfect. And when you make them into Sriracha Salmon Tacos? Jaw drop. Not only do the skewers have amazing color, and flavors, and a great balance of spicy and sweet, but also they’re skewers! Which are my favorite! And they’re SO easy to make. Just take them out of the packaging, throw them on the grill, and they’re done within minutes. 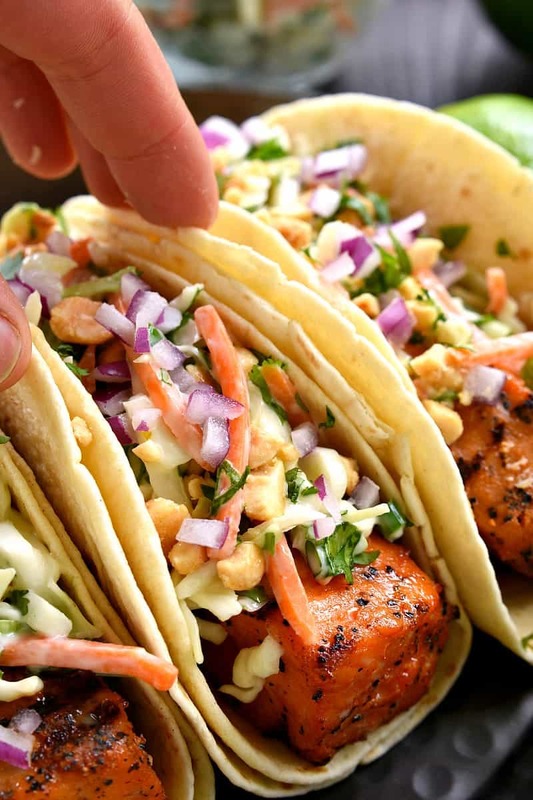 Honestly, they would be completely delicious all on their own, but when you use them in these Sriracha Salmon Tacos, they’re beyond amazing. I kept it simple with a creamy Cilantro Lime Cole Slaw and some chopped peanuts for added crunch. Prepare salmon skewers according to package instructions. While salmon is grilling, in a medium mixing bowl combine cole slaw mix, cilantro, mayo, shredded carrots, lime juice, and honey. Mix well. Assemble tacos using 1-2 tortillas per taco. 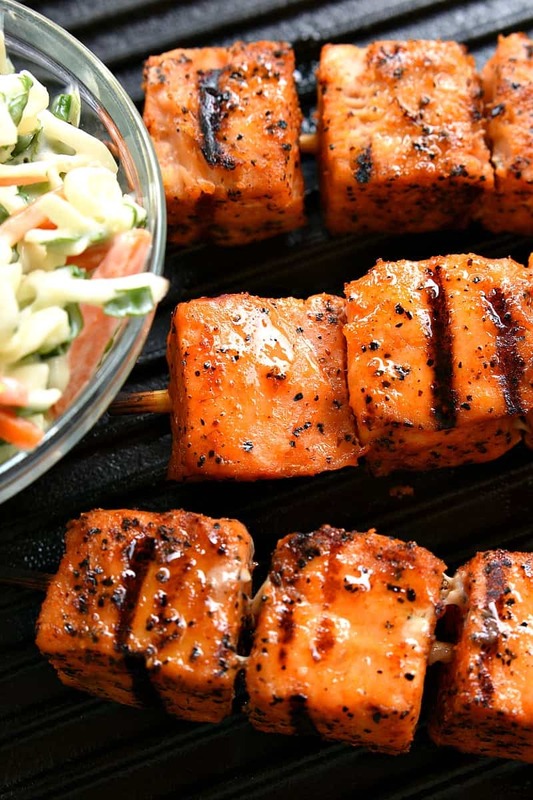 Fill with 1 salmon skewer and 1/3 c. cole slaw; top with chopped peanuts and additional fresh cilantro as desired. These look amazing! When I was in Puerto Vallarta over the summer nearly early day we’d get marlin on a stick. It wasn’t coated with sriracha per se but like a homemade chili oil and it was sooo good. This recipe reminds me of it and looks so good! I would eat it them on a salad!!! Yum!!! I can’t wait to make these for dinner tomorrow night!!! I just looked on Sea Cuisine’s website and they sell them at my grocery store!!!! These look great! Perfect meal for summer! I would eat them in this very recipe. Yum! We love salmon in this house. How easy that the flavorful rub is already on the salmon! Love that time saver for sure. 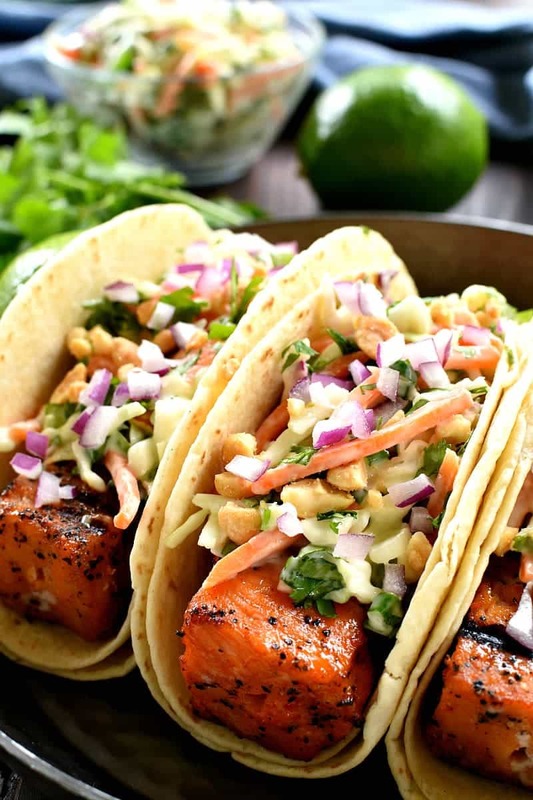 We are a salmon loving house and these tacos look perfect for dinner!! I love any unconventional taco recipes, and this one is amazing!! These tacos look amazing. Absolutely love salmon. Thanks for this, my husband will love this!!! This would be something fun and different to serve on Taco Tuesday! I would serve these skewers on top of couscous and add a side of steamed veggies. These look delicious! I need this in my life. Salmon!!! This looks like such a perfect dinner! I love the heat plus the coleslaw…perfect flavor combination! I love a good fish taco! What a great recipe. I would eat these just like your recipe as taco’s. Really looks delicious. Thanks so much. I would definitely eat them in a salad. I would have these yummy salmon pieces at make them into a Smoked salmon wrap for lunch! I would serve with some basmati rice! I would eat them in a wrap for dinner with my family. I would make salmon tacos with fresh garden veggies. I would eat them with a ton of grilled vegetables with some balsamic glaze. I would eat them with veggies. I would eat the skewers over grilled veggies and rice pilaf. Oh gosh this recipe looks amazing and I am going to try. I would enjoy mine over a bed of asparagus! I would probably eat them with rice or as tacos. They sound delicious. I would use them to add delicious protein in my tossed salad. We would eat them with veggies. I would eat them in my salad! Looks delicious! YUM! I’d eat them with some steamed or grilled vegetables. I would eat mine with corn and a side salad. I would add these to a spicy seafood salad. I would eat them in a salad. Those look and sound perfect! I love the cilantro added! I would make a Salmon and Cavatappi Pasta Salad with a smoked herb and sriracha sauce! I would eat them just as they are with a side of grilled veggies. 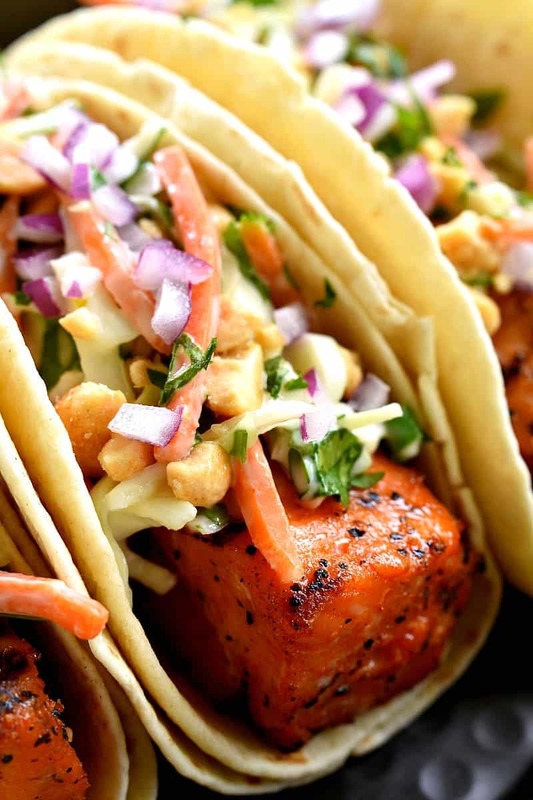 These tacos look like the perfect way to use salmon. I would serve them over rice. I would eat my Sweet Sriracha Rubbed Salmon Skewers in a Mediterranean salad. I would add Spanish rice to the Salmon Skewers. I would serve them over a bed of couscous. I would eat them on tacos! I would put my Sweet Sriracha Rubbed Salmon Skewers on top of a mixed green salad! I would eat my Sweet Sriracha Rubbed Salmon Skewers with butter and lemon, a side of mixed country veggies and mashed potatoes with only butter. I love Sriracha flavor! I would enjoy Sweet Sriracha Rubbed Salmon Skewers with steamed rice.